Notice towards the upper right corner of the image, “Data Analysis” is highlighted in orange. 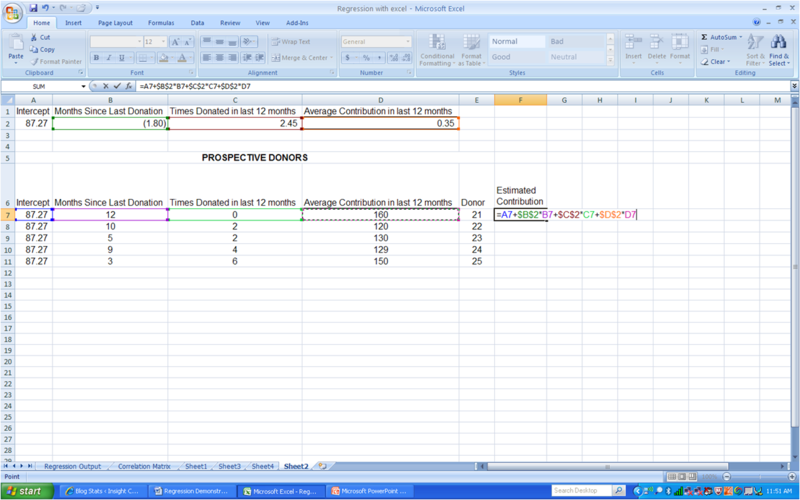 The presence of the Data Analysis icon means that we have activated the Analysis ToolPak Add-In. If it wasn’t there, you would need to activate the Add-In, which you could do very easily by clicking the “Office” button in the top left hand corner, then clicking the “Excel Options” button, which will take you through the process of activating your add-in. Generally in direct mail marketing, three components that often determine how much one spends – or whether he/she buys at all – are recency, frequency, and monetary value – known in short as RFM. Generally, the longer it has been since one’s last purchase (recency), the less he/she is likely to spend. Hence, we would expect a minus sign by the coefficient for recency. Also, RFM theorizes that the more frequently one buys, the greater his/her purchase. So, we would expect a plus sign by the coefficient for frequency. Finally, the higher the customer’s average purchases (monetary value), the greater his/her spending, so we would also expect a plus sign here. RFM is also used heavily by nonprofits in their capital and contributor campaigns, since they are often heavily reliant upon direct mail. 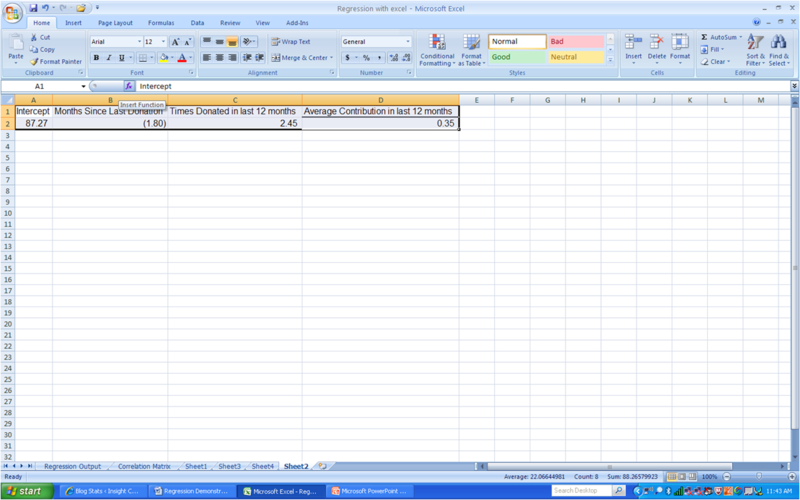 After selecting the regression tool, we need to select our independent variables and our dependent variables. It is best to make sure all columns containing your independent variables are adjacent to each other, as they are in columns D, E, and F. Notice that column C from rows 2 to 22 contains our Y-range values (including the column label). In columns D, E, and F, rows 2 through 22 contain their respective X-range values. Notice in the thumbnail how we indicate those column/row positions for Y-range and X-range values. 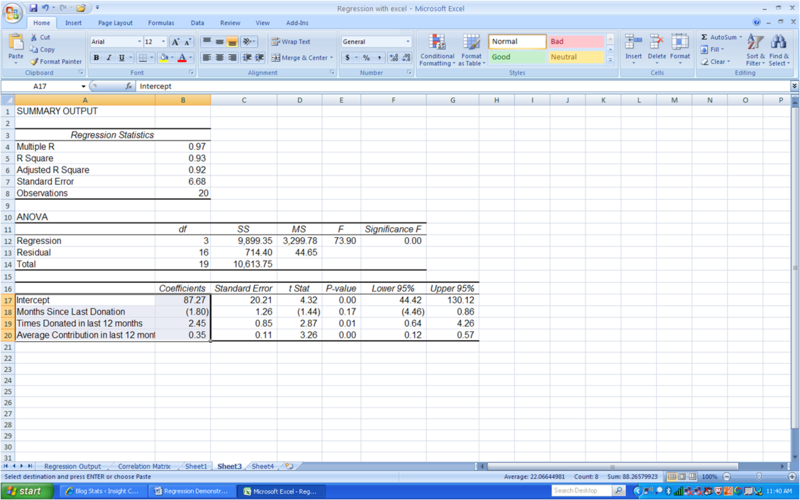 We also need to decide where to place the regression output and what data we want the output to contain. 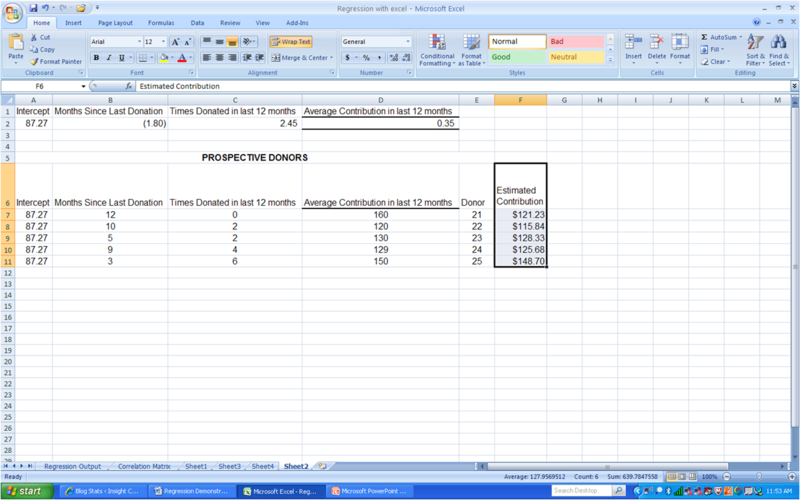 In the thumbnail below, we choose to have the output placed in a new worksheet, called “Regression Output”, and we also check the box indicating that we want the residuals printed. Also notice that we checked the box “Labels”, so that row 2 won’t be inadvertently added into the model. 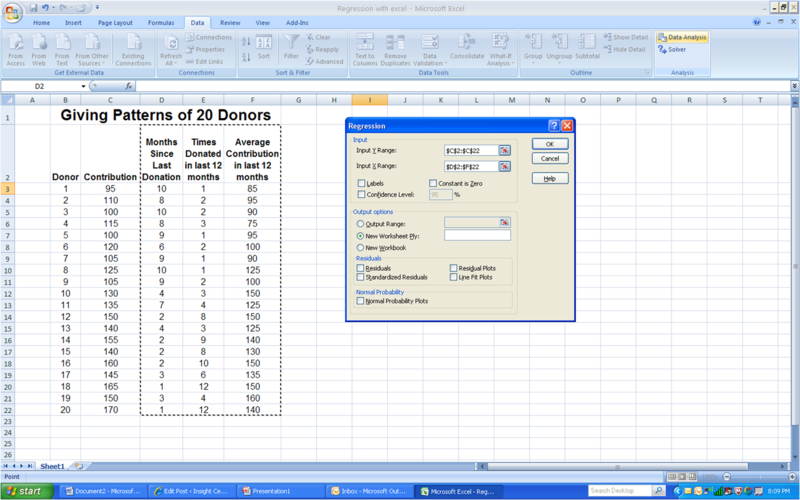 As you can see, cell B5 contains our R2, equal to .933, indicating that 93.3% of the variation in a donor’s contribution amount is explained by changes in recency, frequency, and monetary value. Also, notice the F-statistic in cell E12. It’s a large, strong 73.90, and cell F12 to the right is 0.00, suggesting the model is significant. (Note, the Significance F in cell F12 and the P-Values in cells E17-E20 for each parameter estimate are quick cues to significance. If you’re using a 95% confidence interval – which we are here – then you want those values to be no higher than 0.05). Note that even though we opted to display the residuals for each observation, I chose not to show them here. It would have run below the fold, and would have been difficult to see. Besides, for our analysis, we’re not going to worry about residuals right now. 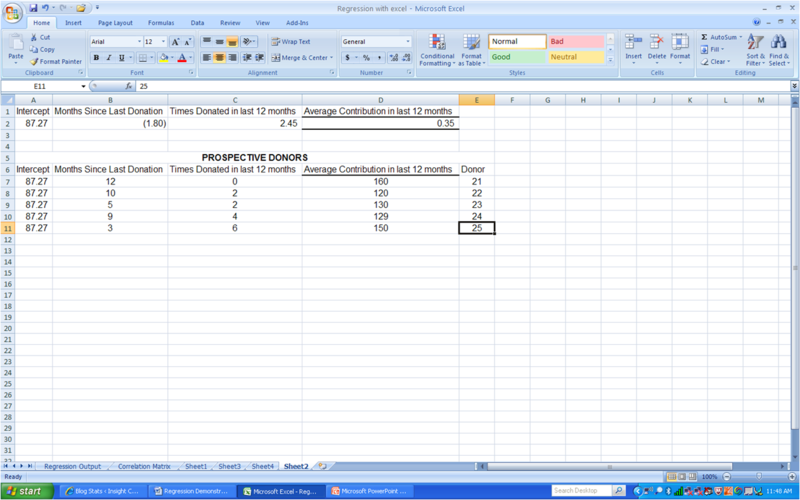 As we can see, each month since a donor’s last contribution reduces his contribution by an average of $1.80, when we hold frequency and monetary value constant. 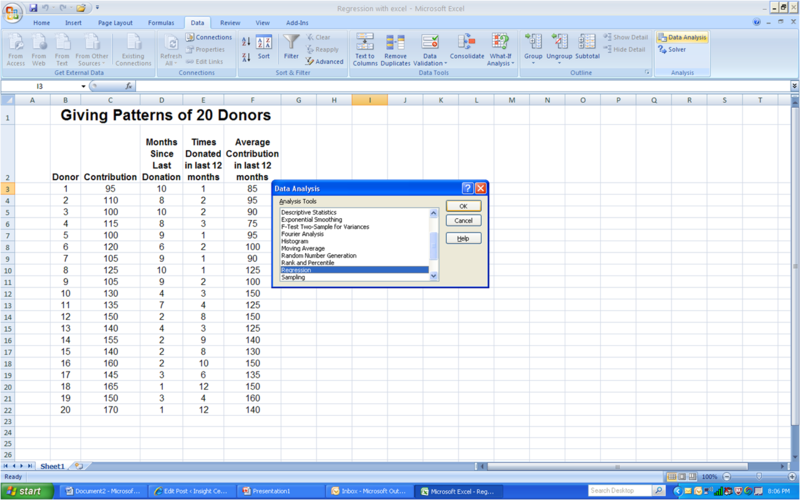 Likewise, for each time a donor has given in the last 12 months, the size of his contribution increases by an average of $2.45, holding the other two variables constant. In addition, each one-dollar increase in a donor’s average contribution increases his contribution by an average of 35 cents. Hence, all of our coefficients have the signs we expect. 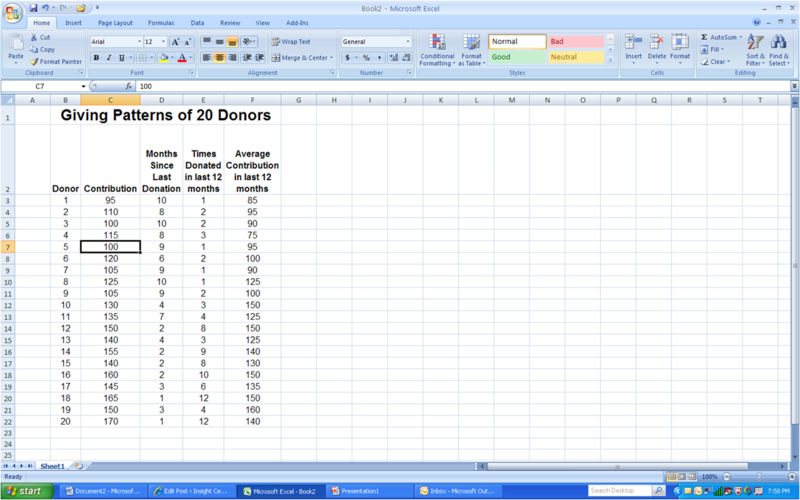 Notice that the coefficient for Months Since Last Donation has a t-statistic of -1.44. It is not significant. Another way to tell whether the parameter estimates are significant is to look at the Lower 95% and Upper 95% values in columns F and G. If the lower and upper 95% confidence interval values for a parameter estimate are both negative or both positive, they are significant. However, if the lower 95% value is negative and the upper 95% is positive (as is the case with Months Since Last Donation), then the parameter estimate is not significant, since its confidence interval range crosses zero. Hence Months Since Last Donation is not significant. Yet, the model still has a 93.3% coefficient of determination. Does this mean we can drop this variable from our regression? Not so fast! Generally, when an independent variable we expect to be an important predictor of our dependent variable comes up as statistically insignificant, it is sometimes a sign of multicollinearity. And that is definitely the case with the nonprofit’s model. That will be our topic in next week’s Forecast Friday post. Since we’re going to take on multicollinearity next week, let’s pretend our model is A-OK, and generate some forecasts. 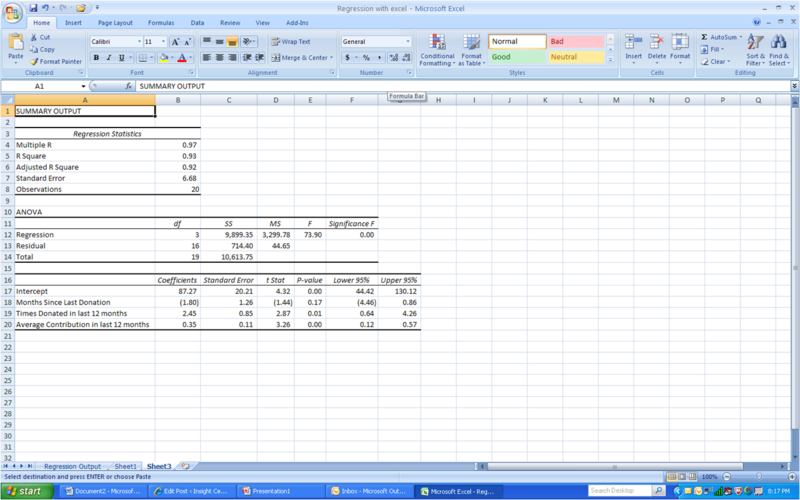 Today you learned how to develop regression models using Excel and how to use Excel to interpret the output. You also found out that our model exhibited multicollinearity, a violation of one of the key regression assumptions. Next week and the week after, we will discuss multicollinearity in depth: how to detect it, how to correct it, and when to live with it. We will again be using the nonprofit’s model. As I’ve said before, models are far from perfect and, as such, should only aid – not replace – the decision-making process. 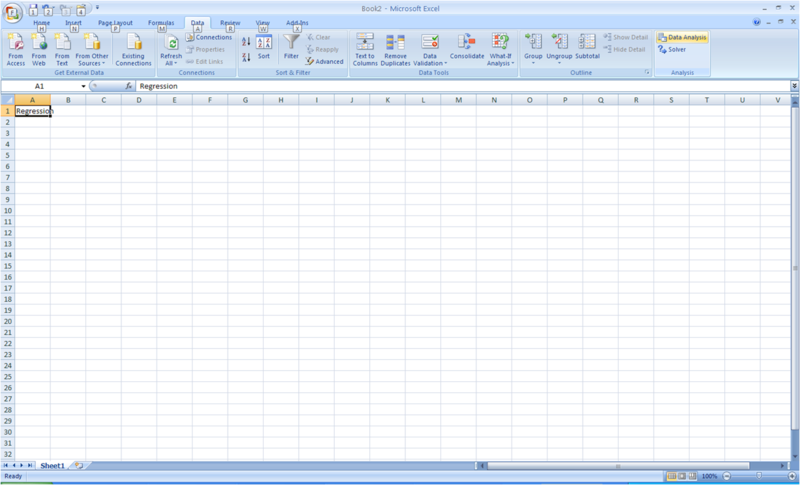 1 Note: Excel is a registered trademark of Microsoft Corporation. 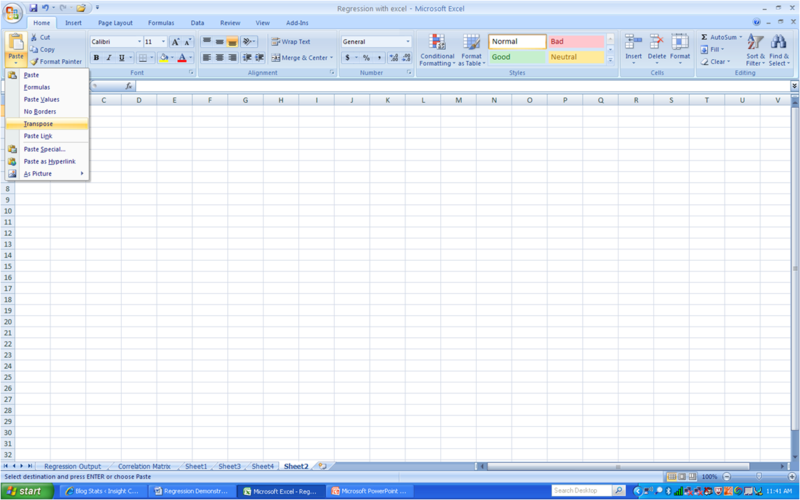 Use of Microsoft Excel in this post is intended only for a demonstration of how to use Excel for regression analysis and does not constitute an endorsement of Microsoft Excel or any other Microsoft product by Analysights, LLC. If you Like Our Posts, Then “Like” Us on Facebook! Analysights is now doing the social media thing! If you like Forecast Friday – or any of our other posts – then we want you to “Like” us on Facebook! By “Like-ing” us on Facebook, you’ll be informed every time a new blog post has been published, or when other information comes out. Check out our Facebook page! This entry was posted on July 8, 2010 at 12:01 am and is filed under Analysights, Direct marketing, Forecast Fridays, Forecasting, Marketing Analytics, Statistics. You can follow any responses to this entry through the RSS 2.0 feed. You can leave a response, or trackback from your own site.